Sravasti, capital of an ancient kingdom by the same name, is sacred to the Buddhists because it was here that Lord Buddha confounded his critics with a million fold manifestation of himself, seated on a thousand-petalled lotus, as fire and water emanated from his body. The nearest airport is in Lucknow (151 kms) and the railhead is in Balrampur (19 kms). The Ananda Bodhi tree : This tree, under which Lord Buddha Meditated for a night, is said to bless the devotees who meditate under it as it was specialized by Lord Buddha himself. Jetavana : The Jetavana is said to once host Lord Buddha and his pilgrims, where One of his followers, a rich merchant, covered the whole ground of the park (vana) with gold coins. Lord Buddha used tehse coins to build a Vihara here. While there are stories that Jet Vana once housed a giant seven-storied-building, some others believe that the first statue of Lord Buddha was built here. Whatever the story, in reality, the place is a cool and peaceful alternative to forget any other care of life and this, makes one believe the facts that are running as folklore among the local community. There are, however, some sculptures built by The Ashoka which are nonetheless less attractive than other monuments built by him. The ancient temple built by an old Chinese monk is also part of tourist attraction, due to the story attached to it. Shobhanath temple : the Jain pilgrims revere this temple, believed to be the birthplace of a Jain saint, Sambhavnath. Devi Patan temple : This temple, believed to be a one of the foremost shaktipeeths, for the Hundu pilgrims is also one of the most pristine places on earth. 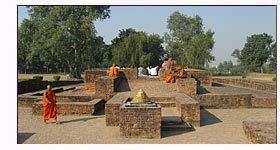 It is situated at a distance of 28 Km from Shravasti. 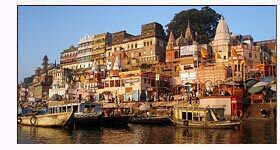 Varanasi : Varanasi, or Banaras, actually is the base for all tourists coming to visit Sravasti. The holy Hindu place is well known for the religious and mythological attachments in Hindu fraternity all over the world. It houses the Banaras Hindu University, a centre for studies of Hindu art and culture. The Ghats by the river Ganga, and temples are emotionally linked to every Hindu devotee and are considered supreme for earning eternity. Kushinagar : Kushinager is, again, a Buddhist Pilgrimage. There are many objects desire for the spiritual minded Buddhist in this place and a lots of Buddhist history takes place, especially that links Lord Buddha, in this place of Kushinagar. By Air : Lucknow, the nearest airport, will serve the air tourists. By Rail : Balrampur is the nearest railhead, well connected to Lucknow and thereby to other major cities of India. By Road : A good network joins this city to major cities of Uttar Pradesh. Manage by Sri Lankan monks.